A Bloomberg story published today calculated out how much money Tesla likely spends, and the answer is not at all pretty. It’s terrifying, actually. The company is burning cash so fast, Bloomberg’s data claims, that there’s an actual chance it could run out sometime this year without financing to help it along. Free cash flow—the amount of cash a company generates after accounting for capital expenditures—has been negative for five consecutive quarters. That will be a key figure to watch when Tesla reports earnings May 2. [...] While Musk’s vision for the future once called for extreme automation, the present day is all about manpower. Back in 2010, Tesla had just 899 employees. Today, the company has nearly 40,000 workers. The ongoing hiring binge is probably contributing to Tesla’s financial straits. 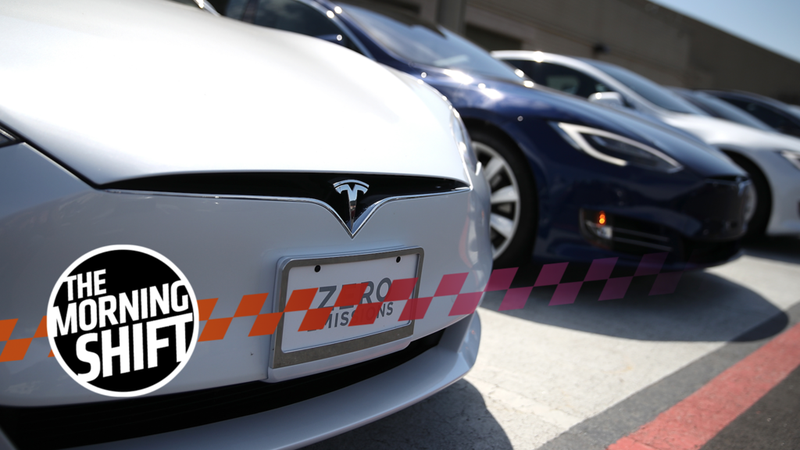 Tesla has added employees faster than it has boosted revenue in three of the last four years. This includes more than doubling the workforce in 2017, when the company was scaling up for Model 3 production and took on employees from SolarCity Corp.
Tesla’s employee roster more than tripled from 2014 to 2017, and revenue per employee stagnated. General Motors Co. and Ford Motor Co. each bring in about 2.5 times as much revenue per employee. Bloomberg’s data shows Tesla’s long-term debt to also be climbing, as well as customer deposits for vehicles that aren’t in production yet. Meanwhile, CEO Elon Musk has been making bankruptcy jokes on Twitter. The Bloomberg story has a lot more on the apparent financial situation at Tesla, once the beacon of hope for sustainable cars. Now, the real question is whether its finances will stay sustainable long enough to carry out that vision, though an outside capital raise seems likely at this point. You’re probably still trying to recover from the announcement that Ford is abandoning all cars in North America except for the Mustang and Focus Active, in favor of this terrible crossover and SUV market we monsters have created. Hopefully you will get through this difficult time through the support of your friends and family, and perhaps counseling. The shock is understandable, considering that that decision has direct impacts on our favorite ST and RS performance lines. Sure, reports were that Ford was losing money on the Fiesta, Focus and Fusion, but what about our feelings? Because of that unbearable sadness about the future, you probably missed some of the announcement details—one of those being that this only applies to Ford sedans, and that Lincolns will stay around. Lincoln sedans aren’t exactly hoon machines, but it’s at least nice to know that not everyone is giving up on cars. But Ford remains “committed” to the Lincoln MKZ and Continental, a spokesman said Wednesday night. There were no details forthcoming on the schedule for updating those two premium sedans. Ford says the Taurus and Police Interceptor sedan will end production in March 2019, with the imported Fiesta leaving the market in May of next year. The Ford Fusion, which gets a facelift for the 2019 model year, its second in three years, will not be replaced, which means it probably has until 2022 or so, depending on sales. Actually, the Lincoln stuff doesn’t make it that much better. This still hurts. Top-level talks on the future of the North American Free Trade Agreement are on hold until May 7, according to Reuters. That’s so U.S. Trade Representative Robert Lighthizer can take a trip to China, and for the purpose of consultations between those representing Mexico in the talks and those in its auto industry. The question of how much content in a vehicle should be sourced from within the NAFTA region to qualify it for duty-free status is proving to be one of the hardest issues to resolve. U.S. negotiators initially demanded that North American-built vehicles contain 85 percent content made in NAFTA countries by value, up from 62.5 percent now. Industry officials say that has been cut to 75 percent, with production of certain components specified in areas that pay higher wages - a demand aimed at preserving manufacturing in the United States and Canada and putting upward pressure on low Mexican auto wages. The Trump administration has threatened to put sanctions on the trade of steel and aluminum from Canada and Mexico on May 1 if they find not enough progress has been made, Reuters reports, and it hasn’t been said whether that deadline will get pushed back now that discussions are on pause. Even Fiat Chrysler Automobiles CEO Sergio Marchionne has said the 2019 Ram 1500 pickup’s launch has had a lot of problems, according to Automotive News. The Sterling Heights Assembly plant is running at maybe 60 percent of where FCA wants it to be, after beginning to build the truck in January. Automotive News reports that all of that has put the new 1500 behind schedule, with dealers receiving only select versions with the 5.7-liter V8 and same fuel-economy ratings as the last generation of the truck.. Supplier and internal sources at the plant said late last week that the factory was building about 1,000 trucks per day toward a run rate of 1,400 per day. The plant is operating two 10-hour shifts per day, seven days a week, to get the production rate up to speed, the sources said. A union source in the plant told Automotive News that suppliers are having difficulty “keeping up” with building two versions of the Ram 1500 simultaneously. The source said the Sterling Heights plant was still undergoing construction, even as workers built new Ram 1500s, and that some workers still lacked proper training. A source who requested anonymity told Automotive News that more than 2,500 new 1500s are in holding areas near the plant, needing electrical repairs before they can be shipped. There’s more on the Ram 1500 production chaos here. With sales declines across the industry and within its scope as well, General Motors decided it would stop reporting monthly sales in favor of quarterly ones. But Bloomberg reports that should it spread, all that trend will do is space out the shenanigans automakers use to boost their sales numbers on paper. A few years ago at BMW and Nissan, those sales shenanigans included having retailers buy cars for their demo and rental fleets. Sneaky. FCA was investigated for over-reporting sales in 2016, too, and Bloomberg reports that the company went back to revise years of sales numbers because of it. Dealers griped that the industry’s immense competitive pressures were distracting the companies from the goal they should have been focused on: getting actual consumers to buy new vehicles. This episode helps explain why General Motors Co. is abandoning monthly sales and reporting them only quarterly instead. Analysts expect the pace of industry sales may have slowed this month to an annualized rate of 17 million, in line with a year earlier. GM posits that the industry would be better off getting these readings every three months: The cutthroat nature of the auto business contributes to short-term fluctuations that aren’t indicative of legitimate trends. Antics of the sort BMW and Nissan were engaged in became part of auto sales after GM’s legendary leader Alfred Sloan pioneered the practice of regular reporting almost a century ago. Contention for best-selling car, truck or luxury brand can translate into marketing muscle that some automakers think spurs even more sales. And executives’ bonuses often depend on meeting or beating targets, adding to the rationale for unhealthy practices. Bloomberg reports that since GM has gone and done it, some analysts think it won’t take long for other car companies to drop public monthly reports for quarterly ones as well—it doesn’t make sense to give out more information than your rivals, obviously. Eastern Airlines, a major airline at the time, began shuttle flights between New York either Boston or Washington on April 30, 1961, according to CBS News. The company promised hourly departures and didn’t require reservations, and one-way tickets ranged from $12 to $14. How nice it would be to pay $12 for a flight these days. Neutral: What Would You Buy If You Could Spend $6,500 A Minute?